Actress Alia Bhatt has two big films lined-up for release in 2019. The first film to hit the screens is Gully Boy, in which she co-stars with Ranveer Singh and in the other is Brahmastra, her film with rumoured boyfriend Ranbir Kapoor. 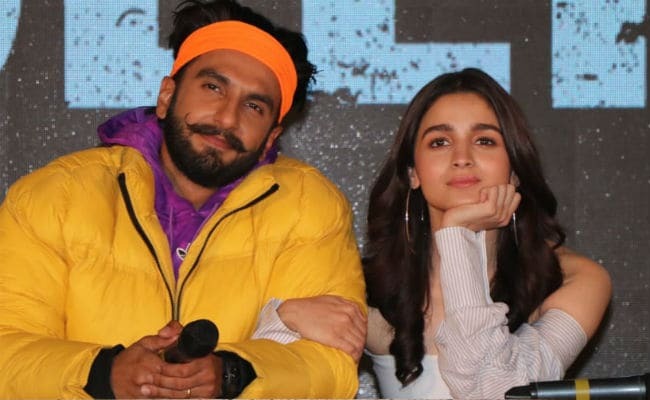 At the trailer launch of Gully Boy on Wednesday in Mumbai, the 25-year-old actress what was the difference between Ranveer and Ranbir, Alia said, "There are lots of similarities. Both are superb human beings and outstanding actors," news agency IANS reports. "Both of them are really special to me and the only difference between them is that with one of them I am doing Gully Boy and with the other I am doing Brahmastra," she added. In Gully Boy, Alia plays Ranveer's love interest. The Zoya Akhtar-directed film based on the life of a group of rappers in Mumbai. Watch the trailer of Gully Boy here. Meanwhile, Alia and Ranbir's Brahmastra is slated to release later this year. Reports of Alia Bhatt dating Ranbir Kapoor started doing the rounds last year after. However, they have neither confirmed nor denied about it. Alia travelled to New York on New Year's to celebrate with Ranbir's family - parents Rishi and Neetu Kapoor and sister Riddhima. Rishi Kapoor is currently undergoing medical treatment in the US. Alia also found a spot on Neetu Kapoor's New Year-special album, in which she posted pictures of all her family members and captioned it as, "All the heartbeats in these." Apart from Gully Boy and Brahmastra, Alia Bhatt also has Kalank in the pipeline.